When you find yourself at a crossroads in life, remember the teachings of Jim Raynor and SlayerS_BoxeR. Charlie Cheever has a list of accomplishments under his belt that would make most 30-year-olds cry. He graduated from Harvard, he helped engineer the megalith that is Facebook - specifically helming the Facebook Connect and the Facebook Platform projects, he worked as an engineer at Amazon, and now he works as the founder of Q&A website Quora. Some of his success is surely just natural - the dude must be a freakin' genius - but Cheever attributes it to another source as well: lessons learned from playing StarCraft. 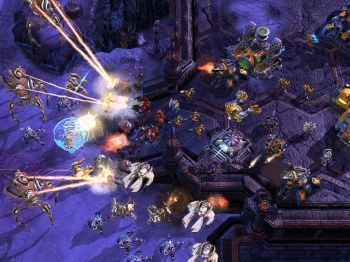 In a giant Q&A posted on his Quora site, Cheever - who is a Diamond-level Terran/Protoss player in StarCraft II - explained how he thought Zerglings and Siege Tanks were relevant to the real world. Timing is critical. For example, Loopt had a lot of the same ideas as foursquare, but started before location services were ubiquitous and commoditized on mobile phones, and so they spent a lot of time doing stuff like striking deals with carriers that turned out to not be that valuable for them, whereas foursquare was able to just focus on iPhone (and later BlackBerry Android) experiences. In StarCraft, timing a push exactly to maximize your advantage is one of the most important principles of the game. Relatedly, you can never get back wasted time. If you forget to build a probe for 15 seconds, you'll never be able to catch up to someone who is executing the same build perfectly. Long term success is usually achieved by getting a small advantage and then using that to get some other kind of advantage. In StarCraft, this can mean something like getting map control with a mobile army then using that to expand safely, which gets you an economic advantage, which then lets you get a huge doom army which will let you win the game. In life, this might mean something like being born into a famous Hollywood family which makes it easy for you to become an actor which makes it possible for you to star in a bunch of movies which lets you get a starring role in TV show like Two and a Half Men which leads to #winning. Artosis' way of talking about this principle in StarCraft is by saying "When you're ahead, get more ahead" (as opposed to just trying to go kill your opponent). It's not one big thing but a bunch of little things that add up. Most games in StarCraft aren't like the InCa vs. Rain game I linked to above - they end up being won because one player is able to squeeze out a few more workers and a few more units and get a slightly bigger army that then lets him/her roll over the opponent. In all the rest of these lessons, it's pretty easy to pick out some story or situation that illustrates the point but it's a little bit tricky because little things like losing a scouting probe or forgetting a chronoboost don't matter that much, but if you play enough games, you realize that all these things add up and sometimes they are really important. Life is kind of the same way. For example, if you treat people well your whole life, you'll find yourself with a whole bunch of friends later on in life and it will be a lot easier for you to be successful, whereas if you rip people off or are just unkind, it won't matter much in the short term but years later, its likely to add up to being lonely and without allies. I think this is my favorite lesson from StarCraft. It's pretty inspiring to be reminded that showing up every day and trying to do the right thing and working hard will probably matter in the long run. If you have time, the full list of nine questions is a great read. Among the topics covered are things like how people are good at different things and should focus on that - like StarCraft units - and how if someone is better than their competitor, they want to play a long game. I'm not sure these are specific to StarCraft, in all honesty - it could apply to any strategy game, ever. But these are important life lessons nonetheless, and where one learns them isn't as important as that one has learned them, period.